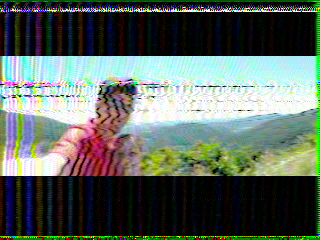 Slow Scan TV (SSTV) is a technique for transmitting images over a radio link. The Apollo missions used it back in the day, and radio geeks use it today. At some point, I'll have to try using my SDR dongle to pick up these transmissions. What my caught my attention about SSTV was this video by The Modern Rogue. In it, our intrepid hosts transmit photos using a pair of cheap walkie-talkies. The main ingredient to this hack is SSTV. But still, the image is definitely there. To complete your SSTV toolkit, you're going to want to install an encoder. Once you do, you'll be able to translate any photo on your phone into the high pitch squeals of SSTV. I'm not entirely sure the best way to use this hack. But it's remarkably to think that if you can talk to someone, you can also exchange images.